Jerry might be a cute little cartoon mouse that makes you giggle, but in real life rats and mice are no laughing matter. Rats and mice are rodent pests that enter homes for food and harborage. These rodents are not picky and will eat anything any human eats. They are scavengers that leave a trail of contamination wherever they go. 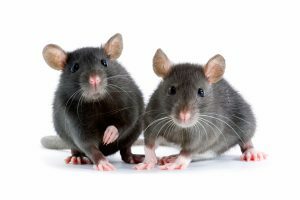 Rodents can carry at least 10 different kinds of diseases including bubonic plague, murine typhus, spirochetal jaundice, Leptospiroses, rabies, ratbite fever, and bacterial food poisoning. Rats and mice start fires by gnawing matches and electrical wires. 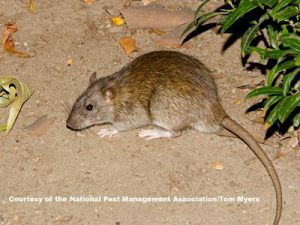 The Norway Rat, roof rat, and house mouse are the mouse are the most persistent rodent populations in need of control. Norway rats are most common along the sea and coasts and canals. Although Norway rats generally prefer fresh meat, fish and grain they can thrive on garbage that is not properly stored. They can survive quite well on one ounce per day of garbage or decaying food along with one ounce of water. 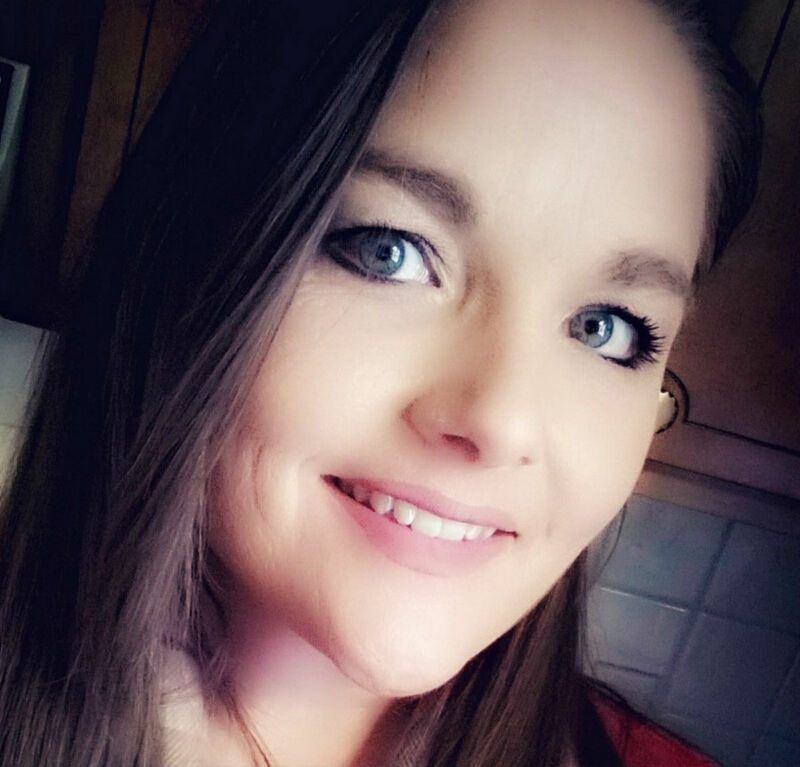 They are reddish brown in color and heavy set with a blunt muzzle. Their droppings are 3/4 inch long and are capsule shaped. Norway rats are burrowers and dig in rubbish and under buildings or concrete slabs. This can cause damage by undermining the foundations of buildings, eroding banks of levees, disfiguring landscape plantings, and blocking sewer lines. They live about 1 year and mature in 3-5 months and have 8-12 young per litter. Roof rats thrive in attics, roof spaces, palm trees, and ornamental shrubbery. They are climbers and prefer to nest off the ground. They can be quite destructive in attics, gnawing on electrical wires and rafters. They generally prefer vegetables, fruits and grain. Color ranges from black to grizzled gray to tan with a light belly. The tail is longer than the combined head and body. Roof rats live about 1 year and reach maturity in 3-5 months. Their droppings are up to 1/2 inch long and spindle-shaped. House mice normally live outdoors in fields, occasionally migrating into structures. They live behind walls and in cabinet and furniture of houses and prefer to feed on grains, but usually will nibble at a wide variety of foods. House mice are brown to gray in color with the tall as long as the body. Their droppings are about 1/8 inch long and rod-shaped. House mice live about 1 year and mature around 6 weeks. Rats and mice are usually attracted to food, so knowing where they are likely to go is important to controlling them. Active mostly at night, it is necessary to see the signs of their activity. 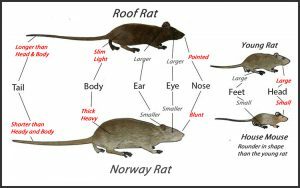 Norway rats and roof rats are aggressive in behavior. Rats and mice frequently gnaw on their surrounding to keep their teeth short and sharp. Active during the daytime if their is an overpopulation, when food is scarce, or when poison has been used. Droppings and urine: Rodents usually have favorite toilet areas, but will defecate almost anywhere. Fresh droppings are black, shiny and putty like. Old droppings are gray, dusty, and will crumble. Will urinate while running, leaving streaks. Their urine will glow under an ultraviolet light and glows blue-white when fresh. Gnawed objects: Teeth marks on food, buildings materials, wire, and edges of beams are indications of gnawing. Runways: Indoors, runways are usually found along walls. Outside runways are paths 2-3 inches wide and appear smooth. Rats will use the same runways between food and water. Rubmarks: Rubmarks on walls appear as black smudges left by they rodent. New marks will smudge. Rafters may show swing marks of roof rats. Tracks: To detect rodent activity, spread dust material like talcum powder along runways. Sound: Usually rodent sounds are heard at night or in quiet areas, often scratching, gnawing and fighting. There are several ways of rodent control: rodentproofing, predators, trapping, runway traps, poisons, sanitation, glue boards and poison baits. Before doing any kind of serious rodent control, it is best to seek the advice of a professional. When you control your rats, try to encourage your neighbors to do so as well. 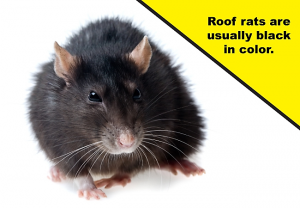 Rats and mice are not only pests, they can also be a health hazard to you and your family. Their effects can spread throughout neighborhoods and need to be taken care of as quickly as possible. It is important to know the signs and characteristics of rodents so that you can determine the best kind of control. Contact your local Extension Office for information on rodent control and other helpful information. ← Teens: Are they dating? Going out? Hooking up?